Shel-Ray® Pet Shalet has a Full Grooming/Spa area to help keep your pet clean and healthy. 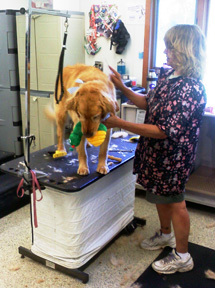 We have the newest in grooming technology and feature Hydro Surge bathing, which is a type of massage for your pet. We offer Healthy Coat which is similar to a hot oil treatment and helps make the pet’s skin and coat healthier and shinier. We use the latest grooming and state of the art Snyder Drying Equipment. We offer a Senior Grooming Discount of 10% on Tuesdays and Wednesdays for anyone over age 65. Hydro-Surge Spa – bathing like a massage! All breeds of dogs and cats are professionally groomed, have special haircuts, are bathed and have personal treatments applied with the latest in pet parlor products. Appointments may be scheduled six days per week, all year long. All spa packages are in addition to bath and grooming prices. Bath and grooming prices are based by breed and coat condition. Please contact us at (262) 857-2163 for more information.